Please contact Fundraising Coordinator JohnPaul. Thank you for signing up as the Volunteer Captain for your football teams Touchdowns Against Cancer (TAC) fundraising campaign. As the Volunteer Captain, you will primarily be responsible for managing and promoting your football teams fundraising campaign to students, fans and community members. Below you will find helpful information on the mission of Touchdowns Against Cancer, your responsibilities, ways to inspire your community, and specific frequently asked questions to your role. Reminder: If you have any questions at any point, please contact JohnPaul at jp@pledgeit.org. He is the Fundraising Coordinator for Touchdowns Against Cancer. Your primary role as the Volunteer Captain is to promote your team’s fundraising campaign and to help your team raise as much money as possible for St. Jude. You role in promoting your team’s campaign directly impacts the main goal of Touchdowns Against Cancer – defeat childhood cancer. This goal will only be achieved by your team’s fundraising efforts. You are tasked with creating awareness at your school and community about what your team is doing during the month of September, and how supporters can get involved. Supporters can either make a pledge per touchdown scored during games in September, or make a one-time flat donation. We also get that fundraising is difficult. Fortunately, you don’t have to do this alone. Our team has put together helpful resources for you to use before and during Touchdowns Against Cancer. You can review any of the below fundraising topics to learn what has worked for other successful teams. If you would like to schedule a call with one of our Fundraising Experts, please click on schedule a call today. You have joined an exclusive group of Volunteer Captains around the country who believe in defeating childhood cancer. There are more than 16,000 children who are diagnosed with cancer every year. Your involvement during Childhood Cancer Awareness Month will provide St. Jude the freedom to focus on what matters most – savings kids regardless of their financial situation. Families never receive a bill from St. Jude for treatment, travel, housing or food – because all a family should worry about is helping their child live. Every donation counts! If you would like to learn more about Touchdowns Against Cancer, please review the below FAQs. What is Touchdowns Against Cancer? Touchdowns Against Cancer is a national program created in partnership between MaxPreps, Pledge It and St. Jude Children’s Research Hospital. 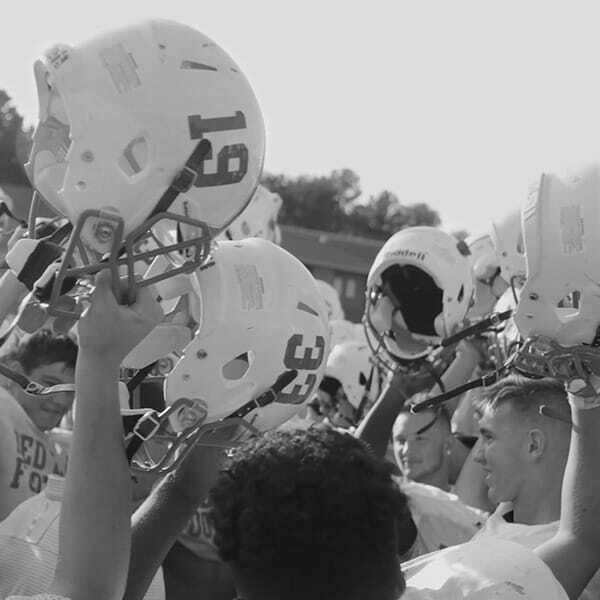 In support of Childhood Cancer Awareness Month, this first-of-its-kind high school football program aims to unify teams across the country for a common cause: defeating childhood cancer. Every touchdown scored in the month of September will directly benefit St. Jude and the fight against childhood cancer. Varsity high school football teams can participate in this unique opportunity by finding their team’s page and joining. Fans can pledge a donation toward every touchdown their team scores during the last three weeks in September. Teams, conferences, and states will compete to see whose touchdowns raise the most in the fight against childhood cancer! What organizations are operating Touchdowns Against Cancer? Touchdowns Against Cancer is a program created in partnership between MaxPreps, Pledge It and St. Jude Children’s Research Hospital. MaxPreps is America’s source for high school sports, dedicated to covering every team, every game and every player. MaxPreps partners with nearly 100,000 coaches throughout America. 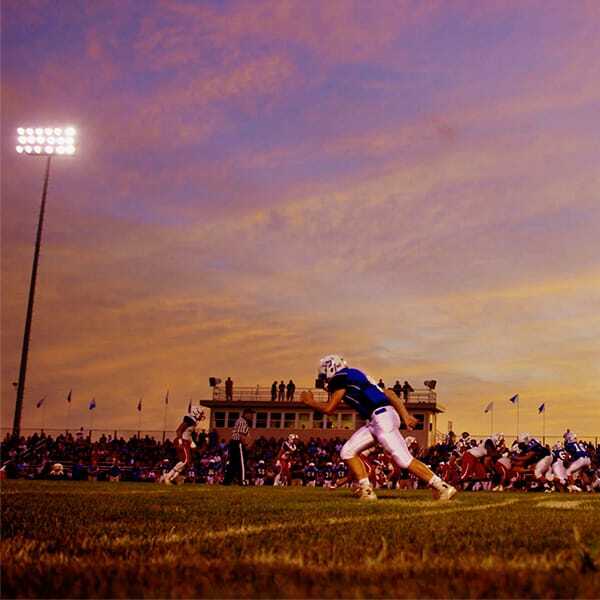 Visit maxpreps.com to follow your favorite high school team. Pledge It is the leading sports fundraising website, empowering athletes to raise money for their team or charity through their gameday performance. Pledge It is powering the team fundraising pages for Touchdowns Against Cancer. Visit pledgeit.org to learn how your team can raise funds with Pledge It this season. St. Jude Children’s Research Hospital is leading the way the world understands, treats and defeats childhood cancer and other life-threatening diseases. The mission of St. Jude is to advance cures, and means of prevention, for pediatric catastrophic diseases through research and treatment. Consistent with the vision of founder Danny Thomas, no child is denied treatment based on race, religion or a family’s ability to pay. St. Jude is a registered 501c3 non-profit organization. Visit stjude.org to learn more. Who can participate in Touchdowns Against Cancer? Everyone – there are multiple ways to participate. Anyone can donate to their favorite team, join as a captain to help lead the campaign, or sign-up to be an individual fundraiser for their team. Go to touchdownsagainstcancer.com to see how you can get involved. Who is receiving the funds raised through Touchdowns Against Cancer? 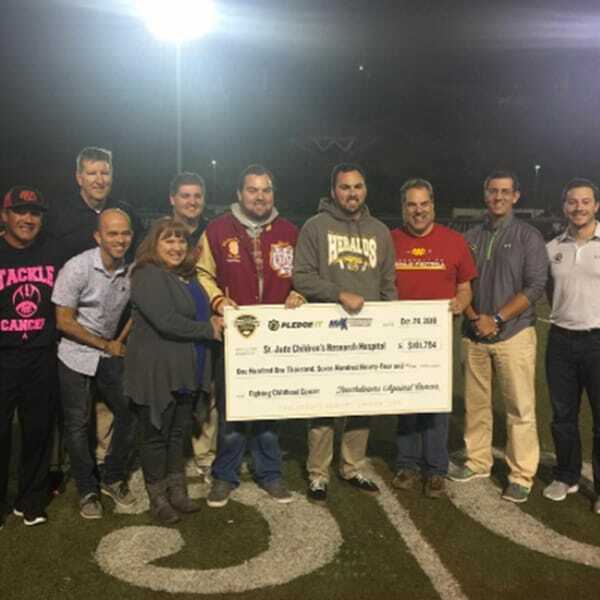 High school football teams across the country are raising money for St. Jude Children’s Research Hospital, a registered 501c3 non-profit organization. St. Jude leads the way the world understands, treats and defeats childhood cancer and other life-threatening diseases. St. Jude is the only pediatric cancer research center where families never pay for treatments that are not covered by insurance. No child is denied treatment because of a family’s inability to pay. To learn more, visit St. Jude. Pledge It is free to everyone, which means 100% of every donation will benefit St. Jude Children’s Research Hospital (minus the 2.9% + $0.30 payment processing fee). All online fundraising requires a third-party payment processor to allow money to be safely collected and transferred online. Pledge It is proud to be free because we understand that when you’re trying to make a difference, every dollar counts. To learn more, visit Why Pledge It Is Free.